Get ready to set sail (er, cruise) with your friends at Focus on the Family and Adventures in Odyssey in November 2017. It’ll be here before you know it, so we’re bringing this to your attention now so time doesn’t pass us all by! Focus on the Family is getting ready to celebrate their 40th anniversary via a cruise aboard the Disney Dream cruise ship from November 13-17, 2017. Plus, Adventures in Odyssey hits a major milestone in November as well: 30 years of stories and lessons that have impacted thousands, if not millions, of listeners. While there is lots to explore and enjoy on Focus on the Family’s cruise and things other than Adventures in Odyssey will be featured aboard, we want to focus on AIO’s activities. We are, of course, a major Adventures in Odyssey fan site, so how could we not? – Adventures in Odyssey 30th Birthday Live Stage Show: Whit, Connie, Eugene, Wooton and other surprise guests will perform an exciting and entertaining Adventures in Odyssey stage show in the Walt Disney Theater. This promises to be the best live show yet! – Adventures in Odyssey Meet & Greet: Meet the cast and crew who bring Odyssey to life! Take pictures, get autographs and make life long memories. – Adventures in Odyssey Story-time: End each day with imaginative bed-time stories from some of your favorite Adventures in Odyssey actors. – The Harlequin Theatre: The playhouse from the town of Odyssey is coming aboard and you can play a part in the action! Your ideas will help create hilarious skits that the Adventures in Odyssey actors will perform live. Don’t miss the laughter and fun with this interactive experience! 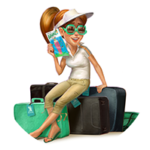 – The Whit’s End Trivia Game: Pit your knowledge of Adventures in Odyssey against other fans to see if you can you top their knowledge. The Focus on the Family Cruise is going to be a one-of-a-kind and memorable experience for all in attendance. For more information on the Focus cruise, visit their official cruise website. Now’s the time to book your family for this event. Stay tuned in the days to come. We’ll release more information as it becomes available.